To help improve student achievement on scale, we need to focus on developing students’ critical thinking skills—specifically through a balance of volume reading, close reading, and argumentative writing. For our students to survive and get ahead, they need to be able to read critically, evaluate, and synthesize information from many different media, especially in a world where most jobs require these skills. Using different approaches to literacy instruction within a single school creates a sea of jargon, leaving students and teachers unable to connect on ideas. This is particularly true for the upper grades where subjects are divided across multiple teachers. Inconsistent language and feedback leaves students confused about their achievement, which makes it more difficult for them to take ownership of their own learning. As our CEO, Eileen Murphy Buckley, always says, a simple, common language that everyone can understand is not a nice-to-have. It’s a must-have for organizations looking to collaborate effectively. So what’s the answer? ThinkCERCA’s platform includes a built-in literacy framework that helps schools break down these established silos and standardize communication across disciplines. Backed by decades of research from the ACT, University of Chicago, Columbia University and others, the CERCA framework focuses on the skills students need to become college- and career-ready. Our platform walks students through the process of evidence-based reading, writing, listening, and speaking by focusing on five key elements that engage students of all readiness levels. Ask students to make a CLAIM - Students build confidence by learning how to express their point-of-view. Ask students to support their claim with EVIDENCE - Students strengthen their close reading skills by learning how to backup their claims with textual evidence. 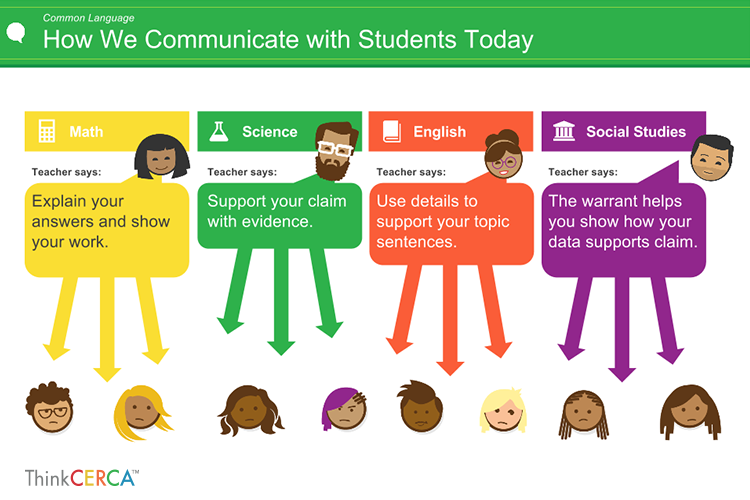 Ask students to explain their REASONING - Students express their critical thinking about topics and texts when they express their thinking about how evidence connects back to their claim. Ask students to address COUNTERARGUMENTS - Students develop empathy, construct new knowledge, and start to value multiple viewpoints by learning how to understand an alternative or opposing viewpoint and respond with an effective counterargument. Ask students to use AUDIENCE-appropriate language - Students strengthen their writing skills by learning how to tailor their message through audience-appropriate language, suitable for the purpose, occasion, and discipline. This framework equips students with a simple process for reading critically and making arguments in every discipline. Plus, with a common language, school leaders and teachers can use common rubrics, leading to common data to better track student progress. And all of this leads to better collaboration. 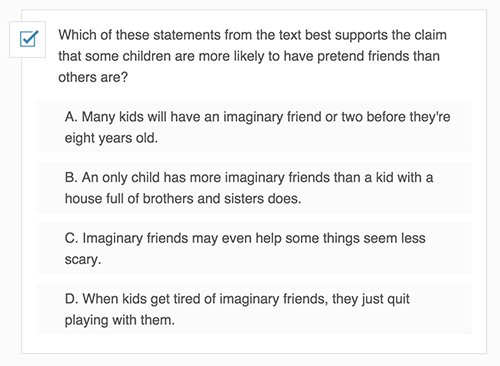 Example grade 4 ELA question from Smarter Balance asking students to match claims with supporting evidence. 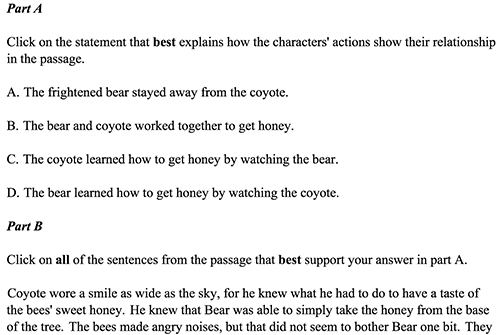 Example grade 4 ELA question from ThinkCERCA. 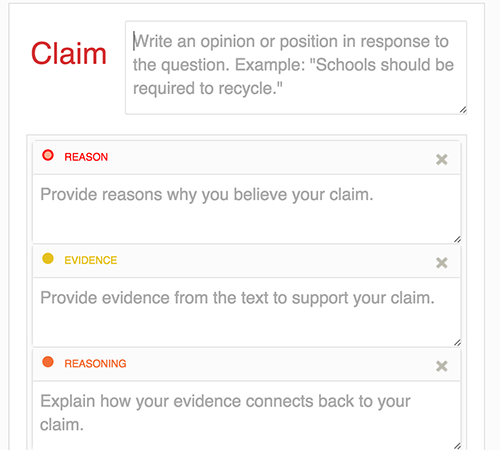 The platform walks students through the process of making and identifying claims and matching them with evidence from a text. 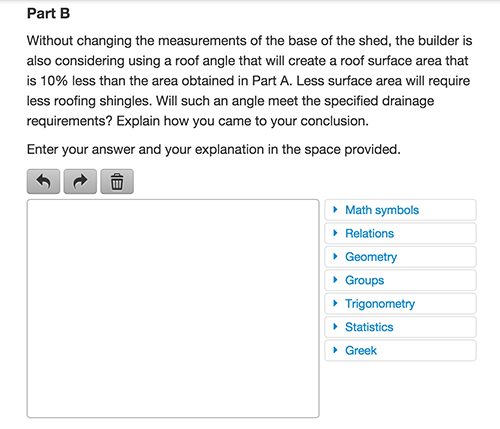 Example grade 9 geometry question from PARCC asking students to support their written claims with evidence and reasoning. 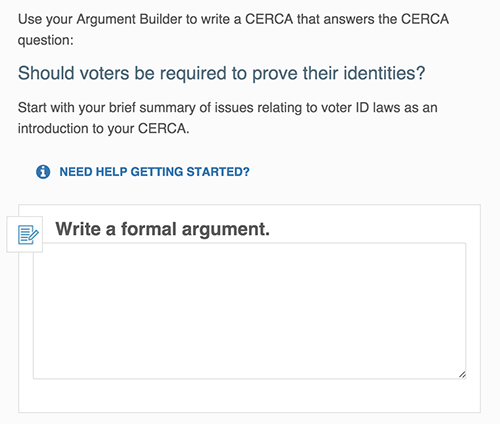 ThinkCERCA's argument builder walks students through the process of making a written claim and backing it up with evidence. Example grade 9 social studies lesson from ThinkCERCA asking students to pull their thoughts together in a formal written argument that links claims to evidence. 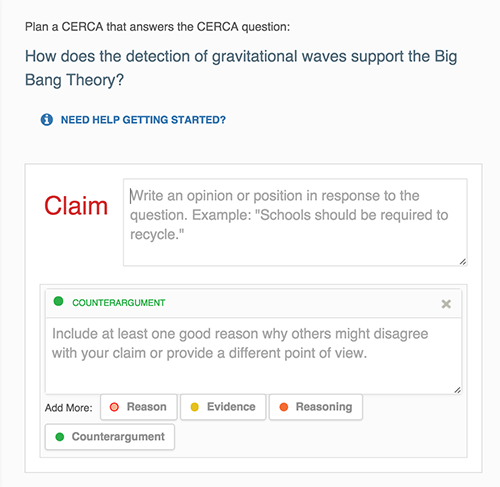 Example grade 11 science question from ACT Aspire asking students to craft a counterargument using evidence. 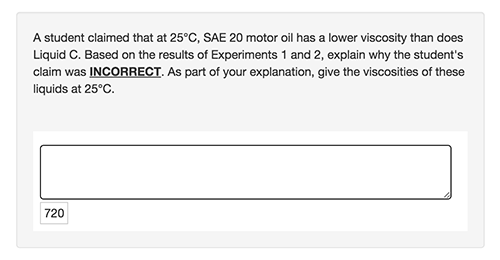 Example 11 science question from ThinkCERCA. The platform walks students through the process of making a cohesive argument after reading a text, including addressing counterarguments. The CERCA framework is also simple enough to engage parents in supporting their child’s learning. Research tells us that involved families are one of five essential components for school success. But parents are often left out of the loop because education terminology is too difficult to explain or understand. Furthermore, education jargon, as it stands in many school districts across the country, doesn’t translate well to the real world, making it difficult for students and families to see the connections. For parents, teachers, and school administrators alike, a common language creates coherency for all stakeholders. To truly improve student outcomes, it’s essential for students to see how their skills will translate to the real world. That starts with a unified language for discussing and teaching critical thinking. Developing this school-wide language is a crucial first step if we want to help students successfully make the transition from the classroom to life after school. The rigorous demands of today’s colleges and jobs require that our children think critically about the world around them. It’s what we like to call “courageous thinking.” Because it takes courage to develop one’s own opinion and even more courage to express that opinion thoughtfully to others. Everyone deserves to feel confident in their own ideas and to have the literacy skills they need to express them.